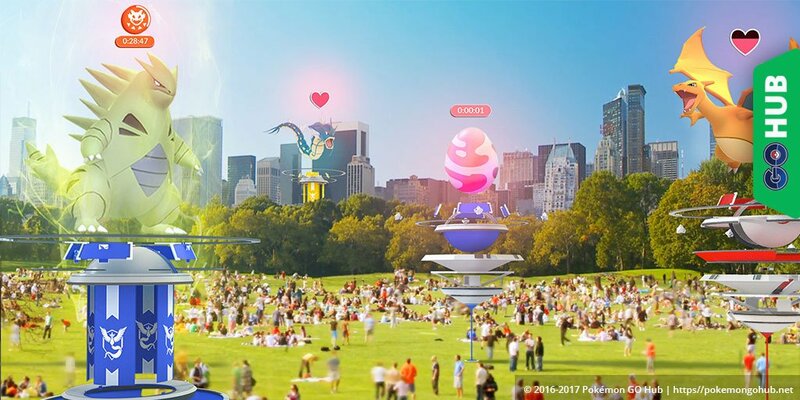 A Pokemon GO Raid Egg appears before a Raid Battle and indicates what type of a Raid Boss will hatch. Raid Eggs come in three tiers: Normal, Rare and Legendary. Raid Eggs have random outcomes, although they are determined on spawn. It’s unclear if players can somehow figure out the contents of the Egg before it hatches. Normal and Rare Raid Eggs were shown at E3 2017 and the Legendary Egg has been data mined by GO Hub in the 0.67.1 APK. How do I know that an Egg appeared nearby? We have data mined the network messages before, you should get a Push Notification saying “A nearby raid is soon starting”, or something along those lines. The exact wording will probably change before Raids get released. How long does the Egg Timer last? The Egg Timer lasts around 30 minutes, meaning you have roughly the same time to witness the raid start. After the Egg hatches, you have one hour to defeat the Boss. You can enter multiple attempts, but each lasts 5 minutes. What Pokemon hatch from the Legendary Egg? Rattata and Pidgey. Jokes aside, Legendary Pokemon, but it’s unclear if it will include the Mew family. Does the Egg have any special mechanics? No, not really, the only mechanic is hatching it. After the has hatched, a Pokemon Boss is revealed and you can start the Raid encounter. Remember that starting the Raid consumes your Raid Pass (Free or Premium). Do Eggs disappear if no one is around? No, they are like a small, localized event that happens regardless of player presence around it.